If you wish your fiber to be further processed after carding, you may choose to have it pindrafted. In pindrafting, your roving is fed several times through a machine called a pindrafter. This machine further processes your roving, drafting it more finely. The pindrafter has many small metal "combs" filled with pins that align the fiber to be more parallel than simple roving. This will allow you to spin semi-worsted yarn. You may also choose to have your fiber blended into various color patterns at this stage. Pindrafting may be the final stage in the processing of your fiber, or it may be the final (required) step before we spin your fiber into beautiful yarn. See the chart below for more information! Technically, our mill does not produce true, round pencil roving, which is a "woolen" process. We use a semi-worsted process in our mill. If you desire a thinner, more uniform roving, which is perfect for new spinnners just learning to draft, or for accomplished spinners aiming at finer, semi-worsted yarns, our pindrafter can produce this for you. If you would like your roving to be blended with a fiber such as silk or nylon, pindrafting is the stage to do this. We can also blend colors at this stage. 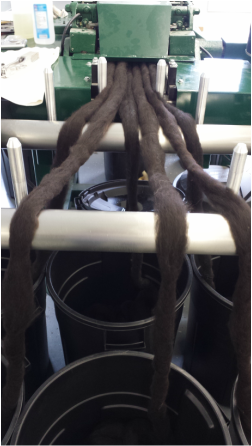 If you have asked us to spin your fiber into yarn, the fiber will be pindrafted to prepare it for spinning.